Well-managed employment relationships can be a secret to business success, yet this factor is relatively poorly understood when it comes to small and medium-sized enterprises (SME’s). Written by active researchers with teaching experience, this book brings together the fields of entrepreneurship and human resource management for the first time, providing entrepreneurship students with a solid grounding in HRM as well as a platform for further critical engagement with the research. The concise and authoritative style also enables the book to be used as a primer for researchers exploring this under-developed terrain. As the only student-focused specialist book on human resource management in entrepreneurial firms, this is vital reading for students and researchers in this area, as well as those interested in small business and management more generally. Why not download our Routledge FreeBook Entrepreneurship for Managers: Strategic Decision-Making for Business Growth? 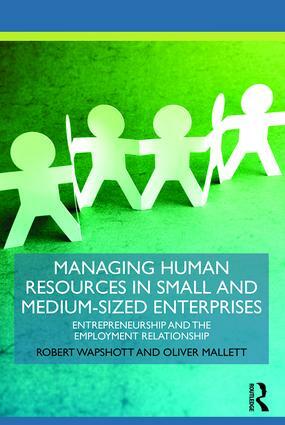 This resource contains a chapter from Managing Human Resources in Small and Medium-Sized Enterprises, along with a selection of excerpts from other titles in the Routledge-ISBE Masters in Entrepreneurship series.